Once again, Ultimate partnered with Mark Deakos of HAMER research group this past week to support Manta Ray research!Marks said that with 90% decline in manta ray sighting rates in Maui, HAMER’s manta ray tagging program is a crucial effort to better understand what habitats are important for their survival and how they use that habitat for feeding, mating and pupping. Ultimate sponsors these satellite tags (think each tag $5K-$10K dollars!) which are placed on the mantas and track their diving depths, surfacing and GPS locations. This tracking helps us protect mantas by knowing where their presence may have potential threats from entanglements, boats and other habitat interference. So why do we care about mantas so much?Not only are these whimsical giants amazing to see while we are diving underwater, they are actually of upmost importance to our oceans health as they feed on plankton and can be an important bio-indicator of the health of the very base of the food chain. This tag was on it’s 3rd deployment and this time was tracking a juvenile manta to learn more about their nursery areas. 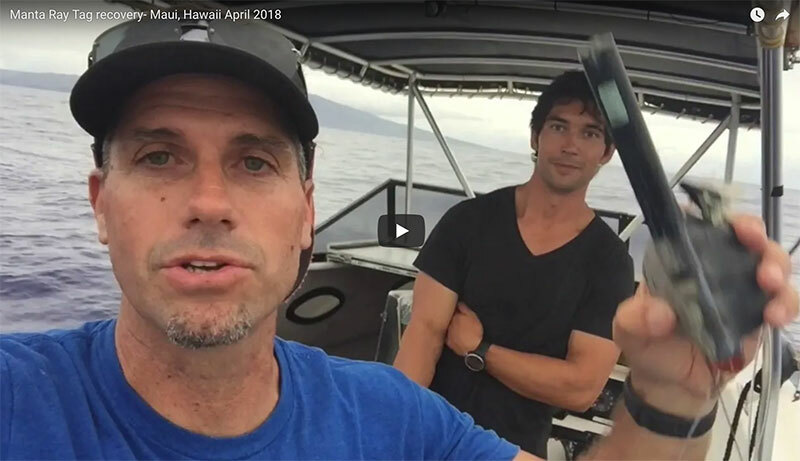 Mahalo HAMER for all your efforts to protect our mantas and letting us be a part of these projects! Want to help support projects like this?